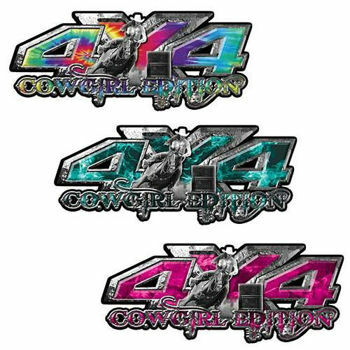 Farm Truck 4x4 Cowgirl Edition Decal Kit / Sticker Set for your 4x4 truck, SUV or Off Road vehicle only from Weston Ink! Replace your OEM factory Chevy, GMC, Dodge, Ford Truck 4x4 decals or add the ones the vehicle didn't come with with this unique colorful design. County girls love their trucks and this will make it like no other. Doesn't matter if you barrel race at the rodeo, love horse riding or are just a farmers daughter that loves her truck these are the decals for you! The smaller size works grat for Quads, Side By Sides, Rangers, Razor's or any ATV and the larger is for those that have modified their trucks to turn them into beasts! Doesn't matter if it gets buried in the mud or never leaves the steet this design will set you aside from the rest. Designed and produced in house using the the best materials and newest processes available. Using the newest printing technology with a 7 color process these graphics pop in color and are highly detailed. New inks also extend the life of the graphic for years to come without any fading.